Farm Shop and Deli Awards 2014: Why your vote matters! We’ve been nominated in the Best Online Business category of the Farm Shop and Deli Awards 2014. And we’re so chuffed! Not only is it a real pleasure to hear that our gift hampers are making you happy. It’s a chance for us to say thanks to all the hard working Scottish food producers who grow and prepare the delicious foods we deliver in our hampers around the UK, Europe and overseas. 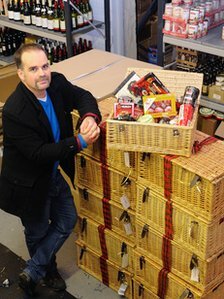 The Farm Shop and Deli Awards aim to recognise the very best standards in speciality retail and to celebrate the highest levels of service, product knowledge, initiative, innovation and community involvement – the very qualities we need from our suppliers for our online gift hamper business. Part of the judging criteria is public votes. When you vote it gives people like us a real boost, To be honest, we can’t stop smiling. And we’d like to spread the love. So if you haven’t voted already please consider nominating the following independent speciality retailers within the following categories. In the Cheese Monger category: Arran Cheese for the delicately flavoured smoked and garlic cheeses we feature in our personalised gift hampers and our diabetic and gluten free hampers too. And in butchery: MacSween for their award-winning meat and vegetarian haggis – so versatile. And don’t forget to vote for us as the Best Online Business while you are there. What happens if we win? Category winners and ten regional champions will be crowned. The Regional winners will progress through to win the overall coveted title of ‘Farm Shop & Deli Awards Retailer of the Year’ announced at the Farm Shop & Deli Show, Monday 25th March 2014 at Birmingham’s NEC. The Awards recognise excellence within the speciality retail market, focusing on independent speciality retailers who sell regional fresh/farm produce or have a delicatessen counter offering twelve categories to enter under and win including ‘ of the Year’. Chair of judges, Nigel Barden, will be joined by leading speciality retailers and key industry figures to bring a wealth of knowledge to the judging process. Vote here or by clicking the #FDA2014 Awards icon on the right. Thank you.